Each apartment consists of two bedrooms, a fully equipped kitchen, and a comfortable shared living area which features free Wi-Fi and cable TV. The bedrooms are either single or twin and there are 3 or 4 students per apartment. Single rooms have a queen-sized bed and twin bedrooms have two twin-sized beds. All bedrooms have desks and plenty of storage space. There are two full sized bathrooms in each apartment, one for each bedroom. The residence also features an outdoor swimming pool (open from late May till end of August), a jacuzzi, an outdoor patio with BBQ area, an indoor gym with free yoga classes, a small library, a study area with computers and a printer, and there is even free tea and coffee available in the lounge. Card operated laundry facilities are available in the basement. EC Washington, DC’s student residence in Crystal City, VA is just across the river from DC. Crystal City is a modern, urban neighborhood with many offices, shops, and restaurants. The Crystal City Metro Station is only 5 minutes away and is accessible from the residence via an underground walkway. Right underneath the residence are the Crystal City Shops, which are home to many designer and boutique retail stores, banks, delis, cafes and even a theater. This shopping center is accessible directly from the residence, which is especially desirable in case of rain, snow, or extreme heat! The heart of downtown Washington, DC is just 20 minutes away by metro and there is a large shopping mall at Pentagon City just 1 metro stop away. Old Town Alexandria is also nearby and is full of interesting history, architecture, shopping, and dining. 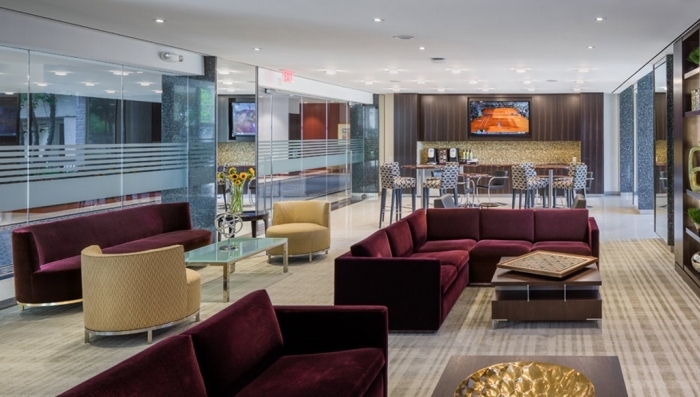 Crystal Plaza aparthotel offers high-end living and leisure facilities in the modern Crystal City neighborhood of the DC Metropolitan Area. •Exit the station at 17th & I Street. Walk along 17th Street next to Farragut Square. At the K St. intersection, continue slightly left onto Connecticut Avenue. •Continue Northwest up Connecticut Avenue and you will see the entrance to the Blake Building at 1025 Connecticut Avenue between Washington First bank and a Nine West shoe shop. The school is on the 7th floor in suite 701. You will need ID to enter the building so please remember to bring your passport. 1. Exit the airport from Door 4 and go upstairs to the Silver Line Express ticket counter and buy a ticket ($5). 2. Take the Silver Line Express bus from just outside the ticket counter to Wiehle-Reston East Metro Station (15 mins). At the Metro Station buy a Smartrip card or buy a ticket to Crystal City Metro Station ($3.60 with a Smartrip card). 3. Take the Silver Line Metro towards Largo Town Center and ride for 10 stops until Rosslyn Station (35 mins). 4. Change to the Blue Line towards Franconia/Springfield and ride for 4 stops until Crystal City Metro station (8 mins). 5. Exit the station and walk via the underground walkway to Crystal Plaza Apartments. 1. Exit from the Concourse (Level 2) at terminals A or B to get to Reagan Airport Metro Station and buy a Smartrip card or a ticket to Crystal City Metro ($1.75 with a Smartrip card). 2. Take the Yellow Line towards toward Fort Totten/Greenbelt OR the Blue Line toward Franconia/Springfield for 1 stop until Crystal City Metro Station (2 mins). 1. Take the BWI Amtrak/MARC Shuttle from the Airport Terminal between Doors 1 and 2 to BWI Amtrak/MARC Station (4 stops, 12 minutes). 2. Walk about 1min to the BWI Rail Station and take either the MARC or Amtrak train to Washington Union Station (30-45 mins). 3. Exit Union Station and look for ‘M’ signs to take you to Union Station Metro Station. 4. Take the Red Line towards Shady Grove for 2 stops (4 mins) to Gallery Place/Chinatown Metro Station. 5. Change to the Yellow Line toward Huntington for 5 stops until Crystal City Metro Station (11 min). Please send flight details or an estimated arrival time at the time of booking accommodation or as soon as possible once known. On arrival, a staff member will be waiting in the lobby to give you the keys and show you to your room. On departure, please leave your room tidy and return your keys at reception in the lobby. If there are any problems, please call the emergency phone number +1 202 909 5873 and someone will help you. Once you arrive at school, you will need to pay a $300 damage deposit which will be returned if the room is in good condition on your departure.